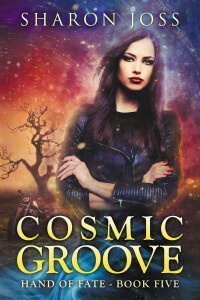 I am thrilled to announce that Cosmic Groove, book 5 in my Hand of Fate series was released this week and is now available from Amazon, Barnes & Noble, Kobo, Apple i-Books and wherever you buy books. Sometimes, every deal is a bad hand. Mattie’s oath to Morta is under siege, and now there’s hell to pay. With an immortal sorcerer and his demon on the rampage, and a feud about to explode between the lycans and the witches, only a bad deal with the dead can help Mattie lift a centuries-old curse and rescue Rhys. But neither Mattie nor her friends suspect there’s a deeper, darker plot that threatens the lives of everyone in Shore Haven. For Mattie Blackman, the Hand of Fate may be a very bad deal indeed. Finishing a novel and releasing it out into the world always brings a fantastic feeling of accomplishment, but also has me on pins and needles until the first reviews come in. Will people like it? Was it worth the wait? I hope so. I look forward to hearing from you. This entry was posted in 2017, Chaos Karma, Cosmic Groove, Destiny Blues, Hand of Fate, happy dance, Having Written, Legacy Soul, Mystic Jive, paranormal, Psychics, review, Sharon Joss. Bookmark the permalink. 2 Responses to Cosmic Groove is Here! I enjoyed Cosmic Groove, as well as your previous novels in the series. You’re a fine writer and you tell a good story. Your writing style is clear and easily understandable. The storylines always move forward to keep the reader engaged. Good job! I read the first four installments of Hand of Fate back in the winter when I had more time to read as my wife and I spent the chilly months indoors at her home in Missouri (in the warm months, we live at my place in the Colorado mountains; a lot of gardening and hiking going on, less reading time).